American Mahjong, more commonly known as Mah Jongg or Maahj, is a variant of the Chinese game mahjong. It is distinct from Asian mahjong in several ways. American Mah Jongg utilizes racks to hold each player's tiles, jokers, and "Hands and Rules" score cards. It has several distinct gameplay mechanics such as "The Charleston", which is a set of required passes, and optional passing of the tiles. 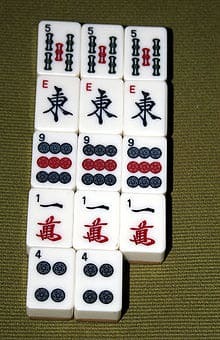 American Mahjong is played with four players using tiles stamped with Chinese symbols. The goal of the game is to be the first to match one's tiles to a specific hand from the National Mah Jongg League's (NMJL) annually distributed scorecard, by picking and discarding, much like the card game Gin Rummy. Scoring is done by matching the points assigned to each pre-determined hand on the annually distributed NMJL card. Joseph Park Babcock, a representative of the Standard Oil Company in Shanghai, was importing mahjong sets to the United States in great numbers by 1923. To increase interest in the game, which was sometimes impenetrable to Westerners, he rewrote and published new and far more simplistic rules that became the American standard. When the National Mah Jongg League, Inc. published a volume of "Official American Rules" in 1935, the American style was further morphed into a very distinct form. American Mah Jongg tournament standards and rules were established in 1986, when the National Mah Jongg League and Mah Jongg Madness jointly conducted their first annual Mah Jongg Tournament at Sea. This tradition of championship tournaments at sea continued for over 24 years. Now, there are American-style Mah Jongg tournaments conducted throughout the United States, and consist of players from America and Canada. The Mah Jongg Madness website conducts more than a dozen tournaments a year and an annual NMJL cruise culminates in the National Mah Jongg Convention in Las Vegas every March. The American Mah Jongg League and several other individual local tournaments have joined in to conduct other well-known events in cities including Atlantic City, Las Vegas and Chicago.